The annual Miami Yacht Show tends to be a brokerage show for the superyacht sector. However, a few builders do schedule stateside premieres at it. Sanlorenzo is among them this year, taking the newest member of its SX crossover series for Americans to see in home waters. 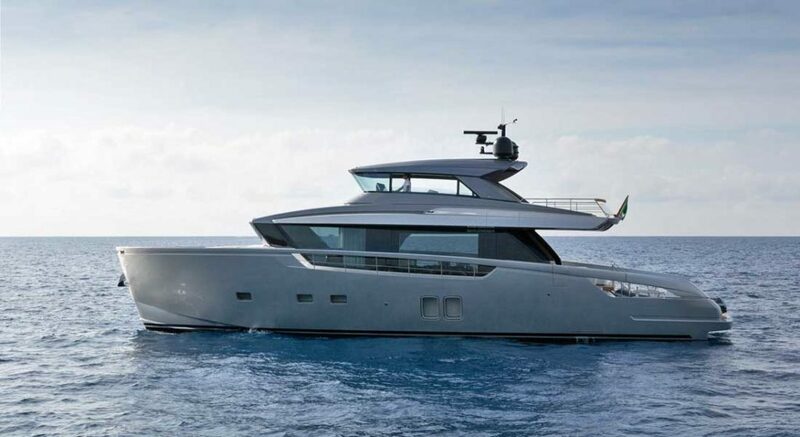 The Sanlorenzo SX76 may “only” be 77 feet (23.35 meters), but she promises space utilization unlike anything else in her size range. Like her big sister, the SX88, this model emphasizes larger, open spaces inside and outside, along with bigger windows, which augment the open feel. A particular feature is the open stern, which you can use in multiple ways. It can be a casual, cascading beach area encompassing 194 square feet (18 square meters). At the show, you’ll see how it’s also a tender stowage area. (Ask to see the tender crane, too, hidden to port in the handrail.) Inside, Sanlorenzo maximizes usable relaxation space by eliminating the interior helm. The only helm sits up on the flying bridge. In addition, it can close thanks to side windows and aft doors. Considering the builder says it’s sold 19 hulls so far in the SX88 series, the Sanlorenzo SX76 should meet with market approval. She offers similar flexibility in the interior arrangement. Below decks, you can have four staterooms, including a full-beam master. A “Lissoni version,” designed by Piero Lissoni, includes just two staterooms and a lounge area. Also aboard the Lissoni version, the main deck’s saloon, dining area, and galley are all open to one another. Alternately, you can have an enclosed galley. Since cruisers enjoy spending much of their time outside, the Sanlorenzo SX76 caters to this desire, too. On the foredeck, you’ll find a welcoming sunpad, which can convert into a dining area. A bimini provides shade here when you want it, too. Yet another sunpad sits tucked into the bow. Even more sunning and general alfresco lounging sits up on the flying bridge. If someone wants shade up here, but still wants to enjoy the open-air feel, the skylounge/wheelhouse comes standard without a separating wall. With a beam of 21’6” (6.6 meters), the Sanlorenzo SX76 looks and feels sporty. She performs that way, too. Twin 800-hp Volvo Penta IPS units should allow a top speed of 22 knots. Those engines also help preserve the shallow draft at full load of five feet (1.56 meters).